A while back I wrote a book review. I had originally intended it to be published in The GIST but after a lot of thought I decided that it just didn’t feel like it belonged there. It was too mental and frankly, a bit neurotic. I was trying too hard to be funny when I shouldv’e gone for informative (which is what The GIST is for). So I sat on it until I could decide what to do with it. With things on here being very quiet I decided that it would be a fitting home for the piece (if for no other reason than this blog is pure unadulterated me). So here it is. Enjoy! And don’t judge it too harshly, You’ve gotta experiment with a few writing styles before you find out what works and what doesn’t. 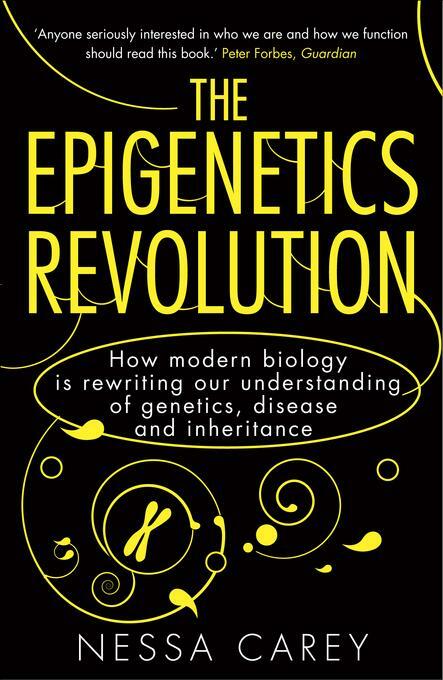 The Epigenetic Revolution. A book by Nessa Carey. My mind has just melted! Just this very moment I have closed a book, put it in my bag, sat back in a chair and – whilst looking at my coffee cup – breathed a heavy sigh; a sigh of astonishment if you will. This sigh is the only way my body knows how to process what’s just happened. I’m flabbergasted, inspired, a little jealous but mostly awe-struck. Awe-stuck by the information that I’ve been feverishly cramming into my eyes for the last few weeks. Information cramming on a scale akin to a bear cramming salmon down its throat before hibernation. The cause of this smörgåsbord of emotions is, of course, the marvellous book that I’ve just plonked back into my bag. The Epigenetic Revolution by Nessa Carey. Front cover of your next book. 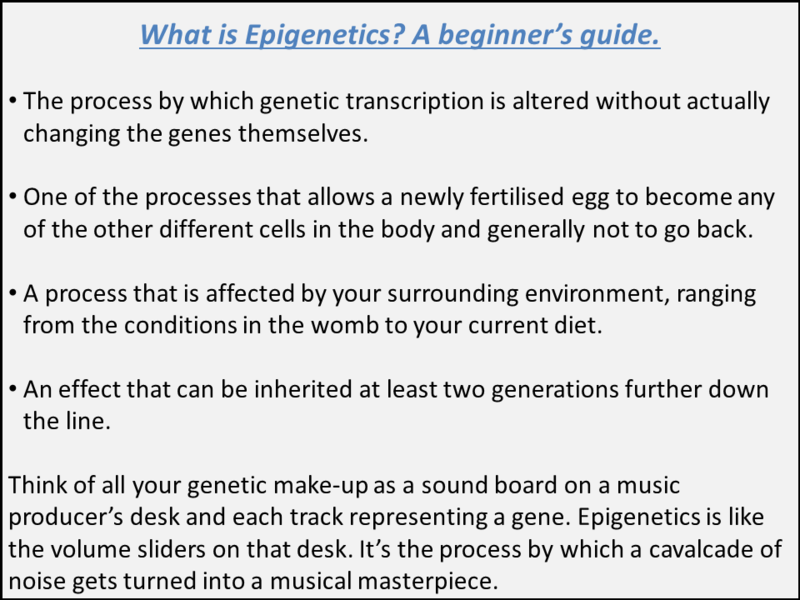 Anyone who has spent more than a passing amount of time chatting with me about most science-based subjects will realise that I quite like epigenetics. Actually, I more than simply like epigenetics. I adore epigenetics. Unfortunately for me I adore it from a distance. I’m like the bloke in a pub who doesn’t quite know how to break the ice with a pretty girl. I think me and epigenetics could be quite good together but I just need an ‘in’, well, needed an ‘in’. I say needed because I’ve just finished this book. Reading it was like skipping past the awkward chat-up lines and nervous jokes and getting straight to the first all-night conversation where you get to really know that pretty girl. Essentially I’ve just become comfortable reading about a complex area of biology. I’ve realised that epigenetics is more than just a brief whirlwind obsession but it’s a truly fascinating area of research. This is more than just a chemist ‘flirting’ with a bit of biology. It’s actually like the first all-consuming phase of any love story. Epi (we’re close now, I can call her that) is all I can think about. I’m finding epigenetic explanations for things everywhere I look. It’s changed my perspective on life. If I were still in high school I’d be declaring my undying love for this personified beauty and defacing my pencil case. But I’m not in high school, I’m a grown man and it’s high time to stop anthropomorphising this book – and my extreme joy at reading it – and time to try and convince you to read it too. Got it? Good. It’s so much more than this but I won’t go into much more detail, primarily because Carey has done it so bloody well. What I will do however is to leave you with the information that has me hooked on this subject and then leave you to go and read this wonderful book for yourselves. Epigenetics is the future of modern medicine. As a chemist, I (and others) look at Epi and see the potential for a new way to treat diseases. Every living cell has DNA, and it relies on that DNA to remain alive and to function properly. If cells aren’t functioning properly and, for example, turn cancerous, epigenetic therapies could quietly shut them off by altering the ways in which these cells make use of the DNA. Teams of chemists and biologists all over the world are trying, as you read this, to utilise epigenetics to treat or cure any number of diseases from diabetes through cancer to schizophrenia. To overly simplify matters, epigenetics could give us a way to obtain the effect of gene therapy without actually having to alter the genes themselves. Don’t you want to know how it actually works?